Yo-yo. Today I’m comin at ya with a quick “What I eat in a Day” post since lots of people seem to be curious about what I eat in a day as a “gluten-free-vegan”. Most people hear that and think I pretty much only eat grass and apples all day long, but there are so many plant foods that are naturally gluten free. I find it so easy to eat and live like this because I stock my fridge and pantry with healthy foods that I love. Eating a healthy plant-based diet has never felt like a chore for me because I truly love all of the foods that I eat. To give you a little more insight into my life, and how I fuel myself as a runner, weight lifter, yogi, and busy dental student. The foods that I eat fuel my lifestyle and give me lots of energy throughout the day to help keep me focused and satiated. Hopefully this post will give you some #foodspiration so you don’t get bored with your meals! Breakfast during the week for me often consists of oatmeal because it is quick, hearty, and leaves me feeling energized for my day. I like to add flax, cinnamon, and vanilla extract to my oats before microwaving, and then I stir in 1/3 scoop of protein powder in after it is finished cooking. Then I like to top it with fresh or frozen fruit, coconut, maple syrup or coconut sugar! 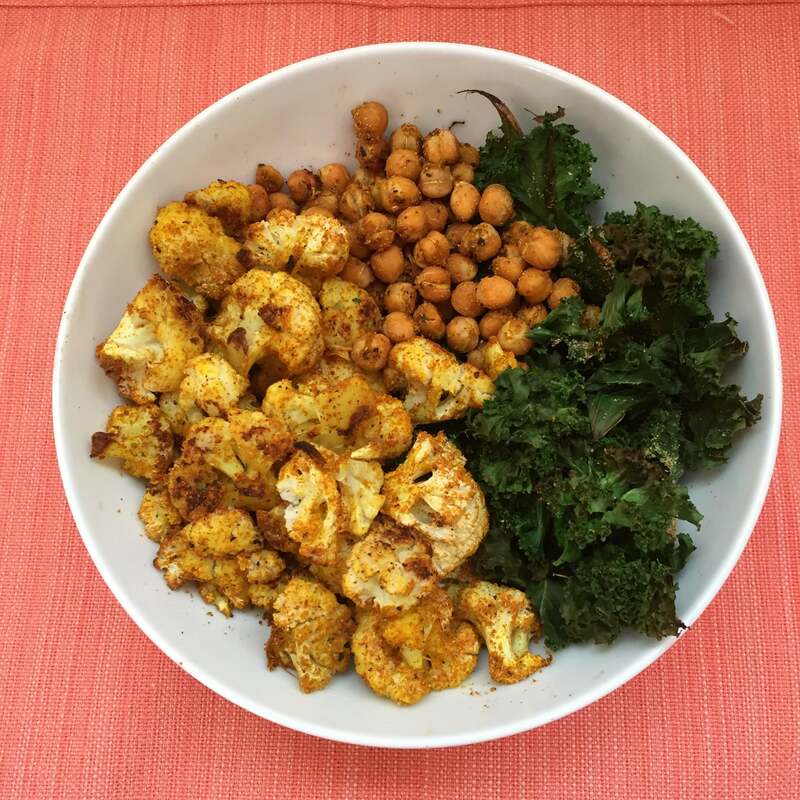 Lunch was a whole head of roasted curry cauliflower and about 1/2 a can of curry roasted garbanzo beans, along with some roasted kale. I love to have beans, leafy greens, and other veggies for my lunches. I try to eat a big variety of vegetables in my lunches and dinners each day to get in a variety of nutrients. Dinner was a huge salad with the other 1/2 of the can of chickpeas, roasted broccoli, roasted sweet potato, carrots, cucumber and spring mix. After taking the picture I added some mashed avocado, sriacha, and garlic hummus because those things are all delicious, but not too aesthetically pleasing. After dinner study snack was Health Warrior Protein Bar! I love Health Warrior bars and especially love the fact that their bars are loaded with chia seeds. I like to think that Chia Seeds have super powers due to all their health benefits. They also are great fuel for endurance runners like myself. What foods have you been loving lately? What are your favorite oat toppings? Best way to eat a sweet potato? Tell me something interesting about your week! I can see how that would be a challenge Deborah. I always like to see what other people are eating to get some foodspiration and try new foods/ combinations I may have not had yet! I am with you on the morning oats, I love topping mine with almond butter, cinnamon, and a half a banana. I don’t typically eat vegan but try to dedicate one day a week to being meatless, I really want to try curry roasted chickpeas next meal! I love all of those toppings too! Cinnamon and banana just go together! Let me know if you try the chickpeas! OOH favorite oat toppings are peanut butter, brown sugar, possibly some fruit, and sometimes yogurt. Also I love how you showcase Vegan eating, because don’t let anyone ever say that vegan eating is boring. All the vegans I know have some of the most colorful delicious looking diets. I love brown sugar and fruit on my oatmeal! And yes, never boring over here! Lots of colorful fruits and veggies do help make things fun! Yes me too! I eat them pretty much weekly! I love boosting oatmeal with some protein poweder, I find it keeps me full for longer throughout the day. I always add some nut butter to my oats. SO true! Protein powder really does help keep me full! Looks like a delicious day! I love making sweet potato fries with savory spices or mashing a sweet potato with cinnamon, almond butter, and raisins. Mmm that sounds so good Liv! You have me craving some cinnamon sweet potatoes with almond butter dipping sauce right now! I had to go gluten free for some medical problems, which have since turned out to be false. That is a hard lifestyle to live – especially with all the cross contamination issues that can happen so easily. Good for you for embracing it! I have actually heard that to be the case for many people! I never feel like having to eat a gluten free diet is a negative in my life because it makes me feel so good! Haha I ate vegan and gluten free for years and people often wondered what I ate or ate what I ate and loved it and were surprised. There are so many good options. While I now eat some gluten (as it’s a sensitivity not Celiac as originally diagnosed incorrectly years ago) and no longer vegan eating seafood and eggs on occasion I still eat mostly plantbased vegan and gluten free as that is what I love and crave. I find that people are so curious! There really are so many great options out there! I love oats in the morning too! They’re so easy, filling, & you can always keep them interesting with toppings! Yes toppings do make it interesting and fun! I love putting guac and beans on my roasted sweet potato!! And my fave oat topic would probably have to be blueberries and dark chocolate with cinnamon! Guac and beans on sweet potato is my jam! I love that combo! You go girl! Way to eat a ton of veggies. I need to up my veggie content. Overnight oats are my breakfast of choice right now. Every single day. I have a feeling soon it will be smoothies. Yesss! Could not give those 2 foods up! My favorite way to top both sweet potatoes and oats is with peanut butter, though sunflower butter is stealing some of the spotlight lately. So good! Mmm I love curry roasted chickpeas! I need to buy sunflower butter, I haven’t had it in so long! !